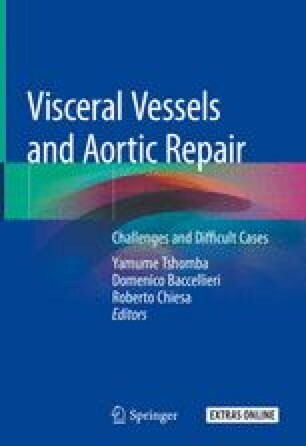 Open repair of thoracoabdominal aortic aneurysms (TAAAs) is an extraordinary challenge for both vascular surgeons and patients. Consistent outcome data have been reported by high-volume centers with 30-day mortality rates lower than 10% and improved long-term survivals . The development of devices and techniques have allowed total endovascular treatment of TAAA with fenestrated (FEVAR) or branched (BEVAR) endografts [2–6]. Early results are encouraging; a recent meta-analysis has reported a 30-day mortality rate of 8.6%, spinal cord ischemia in 17.3% of cases with permanent consequences in 4.9%, and renal failure in 25.4%. However, anatomic feasibility of BEVAR/FEVAR is still limited, manufacturing times for custom devices are lengthy, and open repair remains the only viable strategy in a number of specific conditions, such as emergency cases, infections, and patients affected by connective tissue disorders.